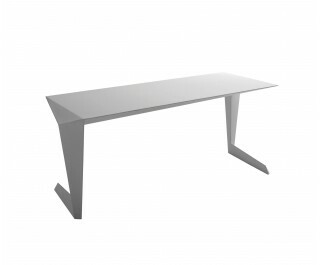 The N7 table, fully made in aluminium, is the result of a close observation of the world: both natural and man made. The Table is a single piece of cast aluminium taking its inspiration from nature in the balance of form and function, and from the man-made world in its appropriation of a stylistic language typically associated with military engineering. Faceted and determined and at the same time functional and elegant. “N7 refers to military and aeronautical iconography. The complexity of the structure, its angular forms, its volumetric details result from a challenging construction closely linked to the use of a specific material (ten bent and welded aluminium sheets) and folding techniques.” “Good Design Award 2008” Chicago Athenaeum.